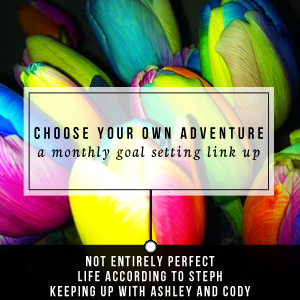 I've been participating in Chose your own Adventure with Stephanie, Steph, and Ashley. November's theme was organize. I didn't get every troubled spot organized, but I did accomplish a lot. 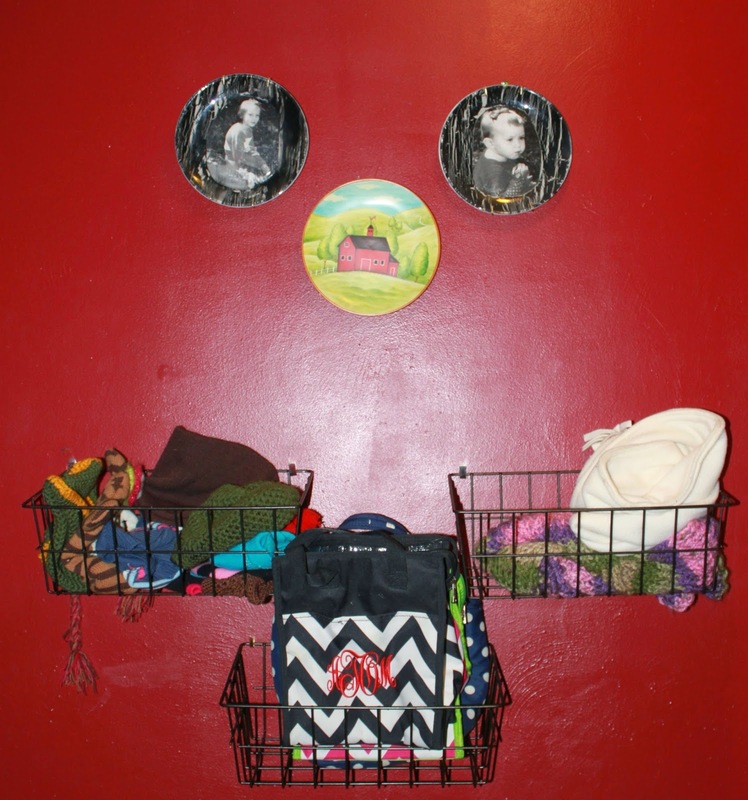 I added a series of baskets in my kitchen/entry way, its an old house, and this area is hard to explain. Technically its in the Kitchen, but could be considered an entry/hallway. Any, whatever..... I wanted something that I could store hats, scarves, gloves and lunch boxes in. I bought plastic coated wire bins from the kitchen storage section. I used walmart but seriously any store would have them. I spray painted it with my new favorite color spray, oil rubbed bronze. I also did this for the laundry room. I also added a lid organizer (from the same department) and organized my pans and baking dishes. I have what I think is the most narrow cabinet known to man. The lid organizer barely fit in this cabinet. but now I don't have to dodge the falling backing pans. They are all lined up waiting for me to make my choice. Then I added this shelf to my bedroom and hung my bags from. Now I can see what I have at a glance. I dodn't get a picture of it but I rearranged some things in my bathroom too. I had two towel bars on different walls. For some reason it really drove me crazy. So I moved one and stacked them. The wall behind the door is now for hanging up towels. Where the towel bar use to be is now an organizer for hair accessories. I seperated them, elastic ties in one, headbands in another, and misc hair things, like the gadgets to make buns, or clips are in another. It really has made finding things easier. December is Simplify. We (the girls and I) have decided to only do the Christmas things that make us happy and bring joy to our lives. No caving in to "you have to, because its Christmas" nope we don't. I will talk more about our Christmas traditions in another post. We are finished with most of our after school activities. Emmy still has Drama and Choir, other than that, we have been coming home, fixing supper, and then literally falling into my bed to watch tv under the electric blanket. You can't get much more simplified than that. I'm really hoping that we can continue this trend all winter. Its been so nice hibernating. Your entry boxes look freaking awesome. I also like that you can see all of your bags. Great job! YES YES YES - we don't HAVE to do anything, why do things that don't make us happy at any time but especially in a busy time like the holiday season? I really like that you guys chose that as your way to simplify. I told everyone in my extended family that I talked to the kids and we decided to create our own traditions and memories that mean stuff to us. They really couldn't argue with that. Well, they could. I just chose to ignore them. me too. I asked what they wanted to do and that's what they come up with. I just hope it doesn't come back to bite me when they have families of their own. I love that shelf with your purses on it! I have a hanging "purse file" but they're not exactly on display, so I'm less likely to actually use them. And it's not nearly as decorative as yours. Great job on your organization goals! Wow you did serious, installing things projects! Nice. Love that shelf with the bags, genius. I agree about Christmas. I'm not letting anyone guilt me into anything I don't want to do. Nothing wrong with making it about you and your girls precious time together. Cute shelf! I should use those baskets. I've tried several ways to organize my purses and there were faults with all of them. This way has been the best. We've just had too many negative Holidays. We really needed to take it back and do what we want. I love being selfish. The baskets have been awesome. I have thought about hanging some inside closet doors to store stuff. Love that shelf with the bags - it's so nice to be able to see everything you have! Love it and totally agree. I feel the best way to simplify over the holidays is by keeping things as stress free as possible.